They can actually get away with distorting the facts like this? With the current financial crisis gripping the world's banks and other financial institutions, it's a real concern to me that predatory lending and unsustainable credit is not only being encouraged but is actively being advertised… STILL! While they're awaiting government bailouts to resolve their own incompetent behaviour, it seems banks are more than happy to continue the practices that got them into this mess in the first place. All this at the cost of unsuspecting consumers who I'm sure they'd be more than happy to come down on like a ton of bricks the instant they're unable to make payments. It's nauseating. 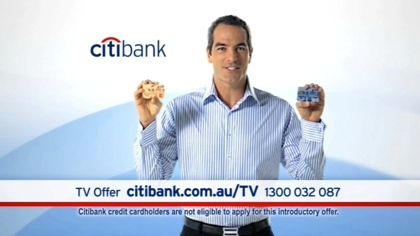 While watching late night television (or very early morning television depending on your definition) I saw an advertisement by Citibank Australia for their new line of gold and silver credit cards. Their argument, presented by a friendly person in simple English, was that credit cards charge ridiculous amounts of interest — sometimes as high as 18, 19 or 20% — and that their line of credit cards offer a very low 2.9% on balance transfers. This fact isn't mentioned once or twice in this longer than usual commercial, but three times. The problem is, while the low 2.9% on balance transfers is presented in bold red text numerous times, only once and in extremely small text at the footer of the screen is it mentioned that the actual credit interest rate for regular payments is a whopping 20.74%, higher than the figure they're advertising for balance transfers and higher even than their previously stated examples of exorbitant credit interest rates. Balance transferral allows you to withdraw borrowed money from one account such as a Citibank credit card, and deposit it into another account. With this functionality you could save money by paying a credit card bill which may have a high interest rate with money transferred from an account with lower interest. Balance transfer interest rates on credit cards though are not the same as the interest charged if you use the credit card like a… credit card. This Citibank advertisement does not explain this, or even mention it. Now I'm not saying that people are stupid and won't know the difference. What I am saying is that these advertisements are intentionally misleading and is clearly intended to entrap people. They entice people with seemingly low interest rates to pay off their high interest credit card bills, then lock them in with their own high interest credit. 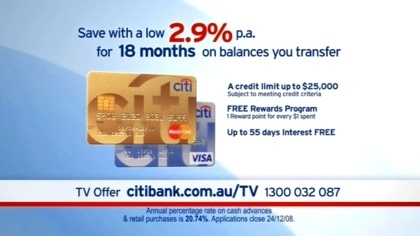 False advertising laws prevent Citibank from claiming 2.9% interest without having the 20.74% real interest in fine print, but the laws also state that misleading advertisements are illegal. 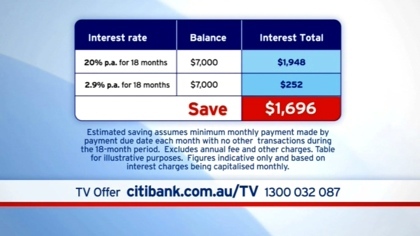 Citibank should have defined balance transfer and displayed the general credit card interest rate alongside the balance transfer rate in the same font size. With Citibank losing more than 90% of its value in the last year and seeking government assistance, they should be held even more accountable now for such advertisements. They won't be, but they should. Later this week, I'll be writing a formal letter to Network Ten the Australian Consumer and Media Authority.